I am all about simplicity in the kitchen. If there is a way that I can make my meals work together and save myself time, effort and dishes, I am all over it! One of my favorite ways to do this lately has been to coordinate the meals within my weekly meal plan. By this, I mean that I try to think of dishes that will work together to create leftovers and/or other elements that will lend themselves to different dishes that same week. The easiest way to accomplish this is to choose a protein type (eg. beef, chicken, fish, vegetarian) and then come up with a combination of meals all using that same protein. Start with a roast in the crockpot and eat it with potatoes, veggies and gravy. The next night the leftover beef turns into fajitas, with added onions, peppers, sour cream and guacamole. A day or two later, the extra gravy/juices from the crockpot are added to the last bits of (now diced) beef with some beef bone broth, carrots, celery, onions, garlic and potatoes and become a delicious crockpot stew. Roast a whole chicken in the crockpot in the morning. That afternoon, remove all chicken from the bones, dice it and put it into meal sized portions. Put the bones back into crockpot for another day, along with water, apple cider vinegar, sea salt, and veggies to make broth. That first night, use some of the chicken along with broth, veggies and your topping of choice to make a savory potpie. The next night that chicken can be tossed with pasta, along with some olive oil, sun-dried tomatoes, garlic, or whatever strikes your fancy. Later that week, the remaining chicken gets added the lovely bone broth you’ve made and becomes your favorite type of chicken soup (chicken noodle, chicken rice, gumbo, spicy Thai, etc.). Bake a whole salmon, with some lemon slices, butter and dill. Eat it that first night with a side of brown rice and steamed broccoli. A couple nights later you can use some of the leftover salmon and make a spinach and salmon quiche. For lunch the next day, finish off the fish by serving up some salmon melts with raw veggies or a green salad on the side. Soak overnight and then cook up a big pot of beans (maybe pinto or black or a combination of 2 favorite types of beans). Simmer the beans with some taco seasoning and use them to top a fresh taco salad or as a filler for soft tacos. Next toss them into the crockpot along with diced tomatoes, other veggies, maybe some ground beef, and seasonings to make a chili served alongside soaked cornbread. Finish them off by making a batch of refried beans, perfect for using in quesadillas or burritos, or to simply eat with rice and veggies. For a great twist on this idea, check out FishMama’s excellent post on cooking once and eating three times! How do you make your meals and menu plans work together for easier meals and greater simplicity? Love these ideas, thanks! I need to hunt down a bigger crockpot. .-= Ginny´s last blog ..Friday Craft: Egg Paint =-. .-= Suzanne´s last blog ..Birthdays and Bibs =-. I plan meals this way too! Saves me a lot of time and money. .-= alexis´s last blog ..Handmade Christmas Thursdays! =-. These are great ideas! I have some things in mind already for next week’s menu, but I will use your method next week for either chicken or beef. Thanks! I do a similar chicken thing: 1st night I roast a whole chicken in the oven with vegetables, saving the drippings. We eat some of the chicken, and then I remove the rest of the meat and save the drippings. Next I use some of the chicken meat and make arroz con pollo (costa rican rice and chicken dish). Chicken carcass goes into the crock pot to make chicken broth. 1 quart of chicken broth gets used with remaining chicken meat pieces for chicken soup, and the 2nd quart I use to cook beans on another night. The chicken drippings go into the fridge, the next day I take off some of the fat, and then I can either add the gelled chicken juice to soup or cook something in it. Love the fish and beef ideas, too. Good to hear how others do it! Great ideas! I’m on the meal planning band wagon right now too…what a wonderful way to streamline life so we (as Mums) can enjoy more of those precious times with our children. .-= Camille´s last blog ..The Old Rugged Cross =-. I did that kind of cooking a few years ago. As the kids grew we had fewer and fewer leftovers. Now I cook for my husband, 2 always hungry teenage boys and my 9 year old boy that eats more than I do. We homeschool, so that means I cook two big meals a day with very few leftovers. I usually try and cook everything from scratch and I try to choose the more natural versions of items. Yes it takes longer but I know what they are eating. these are really helpful and practical. thanks! .-= hailey´s last blog ..Baby No More? =-. This is great. I always cook a lot and freeze/save leftovers, but I think we’d get tired of eating the same leftovers over and over. Turning the proteins into a whole different, yummy meal is a great idea! .-= Megan´s last blog ..Menu Plan Monday, November 9 =-. I like the idea you have about the chicken. 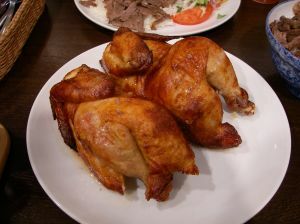 To roast a chicken, do you have to add a lot of water or can you just season the chicken and add a tiny bit of water. I’m finding it hard to see 12 servings coming from that roasted chicken, at the usual weight of about 4 lbs. Can you explain?